joy magnetism: But, what IS it? I love public art. There's something funny about seeing people in public spaces around town - any town - walking around sculptures or other works of art, and trying to figure out what they're looking at. More than in an art gallery, people tend to walk around the piece, inspecting it from top to bottom, presumably because it's out of its element, just sitting in whatever public space it's been allotted. It demands attention. But what is it? Why is it there? Who approved it? Why did they approve this art? I mean, let's face it, when it comes to the public at large, governments, corporations and schools tend to err on the side of conservatism - art that doesn't necessarily challenge anyone to think beyond what they're looking at. In the end, it's the audience that makes that final determination between conservative and controversial. Eye of the beholder, indeed. Whatever the piece is, or how people feel about it, it sparks conversation, and that's the part I love. Take this Large Arch in Columbus, OH, created by English sculptor Henry Moore. I.M. Pei designed the library it sits in front of - in fact, Pei suggested Moore for the library plaza space. 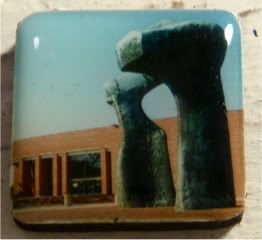 Moore intended for it to be something that people could walk in and around - he was influenced by nature and Stonehenge. That name Large Arch is no joke, either - it's 20 feet tall and 12 feet wide. He designed it in England, but it was actually built and pieced together in Germany and shipped over as one huge piece that weighs as much as an elephant. Moore called it an arch. A large one. But what is it? What did he mean? Is it a gateway to the future? It stands between a library and a church, is it the gateway between knowledge and faith? Or is it just a giant opening for people to walk through? One thing's for sure, in person, it's huge. One might even call it...large. Of course, I saw it only from the slow-moving car, a victim of our family's customary drive-by tourism habits. Speaking of, in my own customary miss-something-by-thismuch, I missed the first Salisbury Sculpture Show, where they had 13 pieces from 14 artists installed in various places around town. I mean, I missed it by like weeks, man! From what I gather, there were some interesting pieces dotting our landscape. I'll be around to see the second Salisbury Sculpture Show happening later this month. When that happens, ya'll can drive by and watch me, walking around each piece...trying to figure out what the heck it is.